A parish priest helped organize some feedback for a NY congresswoman Kathy Hochul (D-NY 26 – Buffalo) running for re-election, a catholic who supports abortion and Pres. Obama’s attack on the Catholic Church and on the 1st Amendment. Rep. Hochul is a candidate denial of Holy Communion under Can. 915. Rep. Hochul, catholic, is a dedicated pro-abortion feminist, committed to raising money for pro-abortion organizations and firmly supported by NARAL. WDTPRS kudos to Fr. Leon Biernat of Our Lady of Pompeii Church and also to 101.7 Catholic Radio. How about sending some Can. 915 swag to Father and to the people at the Radio Station… and perhaps to Rep. Hochul, with a very kind gift also of assurances of prayers. This entry was posted in 1983 CIC can. 915, Dogs and Fleas, Emanations from Penumbras, Religious Liberty, The future and our choices, The Last Acceptable Prejudice and tagged abortion, can. 915, HHS, Pres. Obama, religious liberty, Rep Hochul. Bookmark the permalink. Outstanding! Lay Catholics everywhere need to show the same outrage. Ask “Catholic” politicians in public why they are not supporting Catholic teaching. Thanks Father, I am a Buffalo native. Left in 1972, but still have family there. Will email them all and the brave Father also. It is impossible or me to understand what has happened to western New York State -which was a bastion of Catholicity. There were catholics grade schools almost every 12 blocks with catholic high schools interspersed – I never took a bus to school unitl college. If you weren’t a Catholic of Polish, Italian or Irish descent who could never attain public office. We were proud to be good Catholics and we were….but now in the 2100’s? what has happened -where is the church militant? I have a big ache in my heart tonight…. Small world. Our family may be moving to Buffalo for a better employment opportunity very soon. Can someone recommend a parish and/or Catholic school? I see there is a EF Mass, but that might be a hard sell for the missus until we get acclimated. Obviously if it is OF, I’d want it with as litttle liturgical shenanigans as possible. Thanks. Video! I found video of this! Scott: There are some good churches in Buffalo. We went to one when we were there a few years back that was amazing. It was struggling to stay open at the time, though, and may have since been closed. I couldn’t find it on a map of the open Catholic parishes, so that may be why. Also – there is the Our Lady of Fatima Shrine that is not too far away from Buffalo in Lewiston. They seemed pretty orthodox when I was there. Hochul’s response touches on a real problem. Many Catholics, I’m sure, have started to support the HHS mandate because they were told it no longer violates religious liberty. They many believe that in good conscience too, so I’m not sure the comment about “God’s wrath” is really what’s needed here. The Obama compromise won the support of so many Catholics that people have come to see this as more a partisan issue. candidate in the 26th cong.district to run against this Hochul democrat ! As with most larger cities, there are good parishes and bad ones. I went to college in Buffalo and unfortunately the nearest church was very liberal. It’s not surprising that this catholic is from Buffalo, but I’m glad she was booed! For anyone visiting the area, Our Lady of Victory Basilica in Lackawanna is a MUST see. I was there over three years ago, so I can’t say what the mass is like (I’d avoid the “folk mass”, ugh! ), but the architecture is stunning. In fact, I probably shouldn’t have attended mass there as I was quite distracted by the beauty of the place. They also have a very nice gift shop in the basement. I live in the diocese of Buffalo, and I can tell you that our Catholic radio station (WLOF 101.7) is ON FIRE for Christ! The “Warriors of Love” (http://www.wlof.net/station-events/warriors-of-love) is a prime example. These good people stand outside of Buffalo’s most active abortuary – rain, shine, ice storms, blizzards – faithfully praying the full Rosary (all four mysteries), along with the Divine Mercy Chaplet, for the conversion of all who enter that horrible building. The Warriors aren’t all Catholics, either – many other Christians of good will join them in this very powerful witness for life. The Holy Spirit is doing wonderful things in Western New York. @ Mamajen -Our Lady of Victory Basilica was built by Msgr. Nelson Baker. He is now known as ‘Venerable’ and became so the same day as Pope John Paul II. Please visit the Basilica’s website and read the wonderful story of this marvelous man and his many accomplishments. Pray for ‘Father Baker’s’ canonization. And I love her arrogance saying how she appreciated people coming out today to express their opinions. No, they aren’t opinions, they are truths! Something you laid aside long ago. 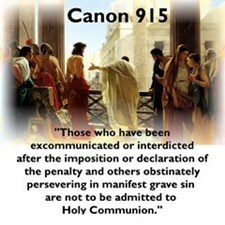 Encouraged to see the bishops actually invoke Canon 915 when it’s called for. Should have been done a long time ago, and still needs to be done more often. These so-called Catholics who run around defying the Church’s teachings, and then her authority, with impunity, confuse everyone else. In my opinion, the Catholic church has a lot of obstinate sinners like this in the US, so much so that there should probably be a couple of cases of this going on in every diocese at any given time. It’s gotten that bad here. Most of the Catholics in public life actually are like this, as well as some columnists and even some employees of the Church. By the way, dissenters who work for the Church, as most dissenters do in some capacity, also need to lose their cushy church jobs. When is that going to happen? @heway I knew parts of his story, but wasn’t aware that he was on the path to sainthood–thank you for enlightening me! I just read through the website, and it was very interesting. How exciting it would be to have another American saint, let alone another from NY! The reporting is just atrocious. It failed to mention any skepticism about the “compromise” and ended with the patronizing comments of the Congresswoman. At no point is the controversy laid in explicit terms. Mamajen – That’s right! Father Baker is definitely on the path to sainthood. Pope Benedict XVI declared his heroic virtues last year (http://www.wivb.com/dpp/news/erie/Pope-declares-heroic-virtues-of-Father-Baker). Sixty years after his death, his blood was found to be still liquid. He may be an incorrupt. Blessed be Jesus Christ, now and forever! I love how the news report completely fails to give any reason whatsoever why Catholics aren’t satisfied with Obama’s “accommodation.” You’d think it would be a journalistic must to state what the problem these people have with the law is, and why they’re galvanized to act in this way….but nope. Nothing. Zilch. Nada. Instead, the report seems to be trying to give the impression (which all mainstream media seems to be laboring to do at the moment) that Obama’s accommodation is perfectly fine and resolves the moral issue, that the accommodation is actually part of the policy anyway, and that (as the representative blithely lies) Catholic organizations are exempt from the requirements anyway, and that Catholics are either mad about nothing, or else trying to get contraception banned. This is a very odd moment in my life. After reading and being both captivated and shocked by the stories of Sts. Thomas More (who would eventually become my patron saint) and John Fisher, seeing blind ignorance, hatred and prejudice, and blatant tyranny destroy the faith and sanity of an entire society (and, ironically, help lead me to the Catholic faith), it’s frankly bizarre to see all those exact same things happening in the present day. The amount of breath-taking ignorance, posturing, and complete, utter abasement before power seen in the media and among so many otherwise intelligent people is horrifying. In its new, aggressively-promoted theories of “freedom of worship,” the Obama administration is essentially creating a political rationale for a complete government takeover of religion…in almost the exact same way in which English Protestants, along with the King’s own band of propagandists, created and promoted a religious and political rationale for the takeover of the English Church by the government. In their vicious assaults on the Catholic Church, aided by reports of terrible misbehavior and sexual sins within the Church and the clergy, the media and other popular personalities are creating widespread and popular anti-Catholicism that is essentially allowing the government to do whatever it wants to the Church with a large section of the population cheering them on…in almost the exact same way the vicious assaults on the Church by various “reformers” in England used the sexual sins of the clergy, paranoia, and religious arguments to turn the populace against the Church and give the government all the popular support it needed to take over the Church and rob it blind. In its dissent, admiration of power and worldly wisdom, and plain apathy, a large section of American Catholicism is poised to break with the Church simply out of inertia or even actively help with its demolition…just like in those days, the Bishops of England (save John Fisher) and so many clergymen yielded to the King’s pretensions with threats and cajolery, while other dissenters within her actively aided him in dismantling the Church. Never mind that these assaults are blatantly unconstitutional…in those days, Henry’s assaults were also in direct violation of the English constitution of Magna Carta, as well as the King’s own coronation oath. In fact, the matter is rather clearer with the Magna Carta than it is with our own constitution. That certainly didn’t stop him. Likewise, all the American Bishops have stood against the effort…but then, so did the bishops in those days, at first. Once Henry effectively blackmailed them financially and militarily, though, they quickly caved in rather than face imprisonment and death. The situation is not all bleak, of course, and there are important differences that are very much in our favor: many, many Bishops so far have shown they still have spines, and that they may very well be willing to go to the mat for this, even to civil disobedience and imprisonment; the Supreme Court has shown it has the guts to oppose Obama’s “Great Matter” in the past, and as long as Obama doesn’t get to pull a FDR against it or continue to nominate justices, it will likely continue to do so; we have a powerful and wonderful Pope who is not currently imprisoned by a Holy Roman Emperor; we have the American system, with all its wonderful checks and balances; and perhaps most importantly at all, Obama is not a King, but a President, and so can be voted out of office. But even if he is…once he has given a future president the tools and rationale to do it, once the media and the populace have shown they are perfectly willing to let him do it…well, does anyone really think the government is never going to try again? I’m honestly less worried about what the Obama administration (cash-strapped, with a lively political opposition, facing a country and an electorate divided against it) will do than what future administrations will do with the ammunition and precedents the administration will provide. I don’t think I need to say much more. It is our imperative as Catholics and as Americans to act now, lest many souls be lost. First and foremost, Obama has to go. I don’t think I have ever been as deeply invested in a campaign season as I will be in this one. Secondly, prayer, penance, a renewal of the Church from the inside, the extending of the mercies and sacraments of God to all the weakest members of the Church…these are indispensable. If the Church doesn’t get herself in order using the more-than-sufficient means and graces he has provided for her, then (as he has done before, many times) God himself will provide a harsher remedy, cut off all weak and unworthy souls with the razor of persecution, and in their stead produce for himself the priceless diamonds of martyrs. If that happens…how many of us will be able to remain faithful? How many souls will be lost? In any event, I am very gladdened to see that there are so many faithful souls who will not go easily into the night. Thank God for Democracy! If we are to be saved, it will not be through kings and princes, but through the people, good, ordinary people, laity, consecrated, and priests who will with their votes, their prayers, and their lives cast down Satan from his throne and help to establish the kingdom of God here on Earth. I am proud and humbled merely to be associated with them. Sancta Maria, mater misericordiae, ora pro nobis. Rex Iesu Christe, Domine misericordiae, miserere nobis. I know Father Biernat; he’s a fantastic, dedicated priest (with a marvelous sense of humor, it should be noted). He was once the vocations director of the diocese. Every diocese has clergymen who stand apart from the rest on account of their orthodoxy and zeal; Father Leon is certainly one of them in this diocese. With him I would name Father Richard Poblocki, a well-known personality on WLOF Radio, hosting a call-in show (and who also has a magnificent sense of humour). WLOF is an excellent Catholic radio station. They carry alot of EWTN’s programming, in fact, including Daily Mass, and call-in shows hosted by Patrick Madrid, Patrick Coffin, and others, and alot of Bishop Sheen’s old shows. So we have our gems, here, to be sure…chiefest amongst them in the history of this diocese being the Venerable Nelson Baker, builder of Our Lady of Victory Basilica and founder of Our Lady of Victory hospital and the various Victory charitable homes for orphans and wayward youth, that saved so many young people from the streets. His cause, as has been mentioned by others, is underway. As far as saints, though, we already have one from this diocese: St. John Neumann. He was not born here, of course, but so much of his ministry was spent here. He founded, among other parishes in the Diocese of Buffalo, St. John the Baptist in Kenmore and Ss. Peter & Paul in Williamsville. Other notables from the diocese include Denis Cardinal Dougherty and John Cardinal O’Hara, both former bishops of Buffalo. And we are very happy to have still with us one of the eldest bishops in the world, auxiliary bishop-emeritus the Most Rev. Bernard J. McLaughlin, who turns 100 this November. @ mamajen: Yes, it would be wonderful to have another Saint in New York in the person of Father Baker! And we sure need more like him! I’ve been to the Fatima Shrine in Lewiston twice (fortunately I didn’t attend the folk Mass), but never been to Our Lady of Victory. @ScottW: I know that this is not a parish church, per se, but there is also a monastery of Discalced Carmelite nuns in Buffalo. It’s named for St. Therese the Little Flower; in fact, the chapel was dedicated on the very day of her canonization in 1925! The nuns still wear the old habit and keep to their Rule. The foundress came from Mexico in the 1920s, when the Church was severely persecuted. She and a fellow Sister faced a firing squad, and she made a ‘dare’ to then-Blessed Therese, ‘If you’re really the Saint that people say you are, then help us here.’ And when the guns fired and the two nuns fell, they found out they had no wounds! They came to the US and founded monasteries in Michigan and New York State. And in 1997 (St. Therese’s centenary of death), the Buffalo Carmel made a foundation in Alexandria, South Dakota.